Save money and space while extending the life of your clothes with this simple laundry hack! How can you resist? Americans may not agree on political issues, reality television, or eating their vegetables, but we do share one sentiment: We hate doing laundry. A recent PopSugar poll put laundry in the top-three tier of most-hated household chores. Washing and drying clothes in a small space makes this must-do even more of a hassle, as DIY blogger Melissa of Two It Yourself was quickly learning. It was hard to be happy about the laundry closet in her new place when her old house had a whole room for laundry, complete with plenty of space for folding. 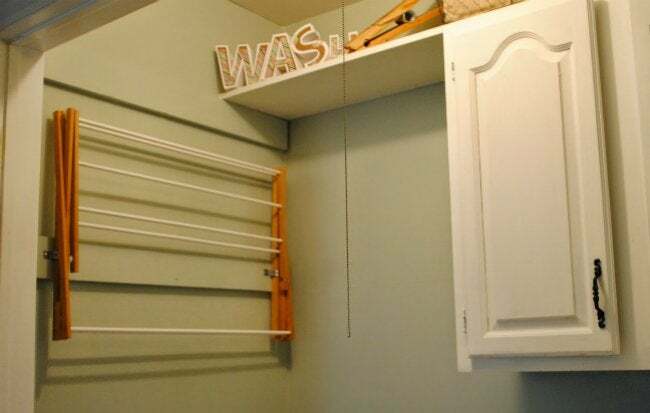 Melissa knew her laundry situation was getting desperate when, after washing a load of delicates, she was “forced to to hang all of [her] unmentionables all over the door knobs on the second floor.” So, using her old wooden drying rack, she crafted herself an ultra-slim, wall-mounted version. The magic of the retractable rack is simple: Like nesting tables or a desktop that folds down, it expands only when needed. When your clothes are finished drying, it folds back up. And when it’s closed, the rack extends only an inch or two from the wall. Because it never touches the ground, this DIY rack saves floor space and sanity! 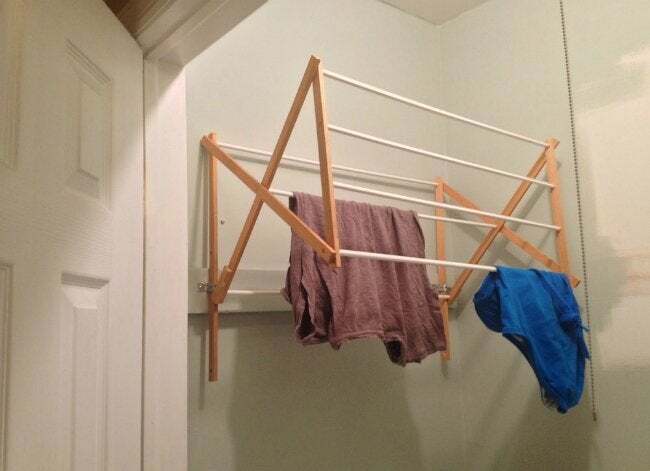 If you’re in need of a quick and functional solution like Melissa, begin by turning a standard drying rack on its side. Starting at the bottom, pull out the bottom four dowels and and four legs by hand, one at a time. You’ll then use a jigsaw to shorten the bottom two front legs, leaving the two back legs long for securing to the wall with plumber’s tape. The rest of the rack stays as is and pulls out at eye level so you can drape delicates over the remaining dowels. For detailed diagrams and instructions on cutting and mounting the drying rack, check out Two It Yourself‘s full tutorial. Even if you’re not short on space, a functional drying rack is well worth having—not only for items that require hang drying, but also because going pioneer-style once in a while saves you some bucks on your electric bill.